Brief summary of the paper: Many animals invest time and energy in removing unwanted organisms from their body surface; however, the benefits of symbiotic cleaning associations to ‘clients’ are disputed. 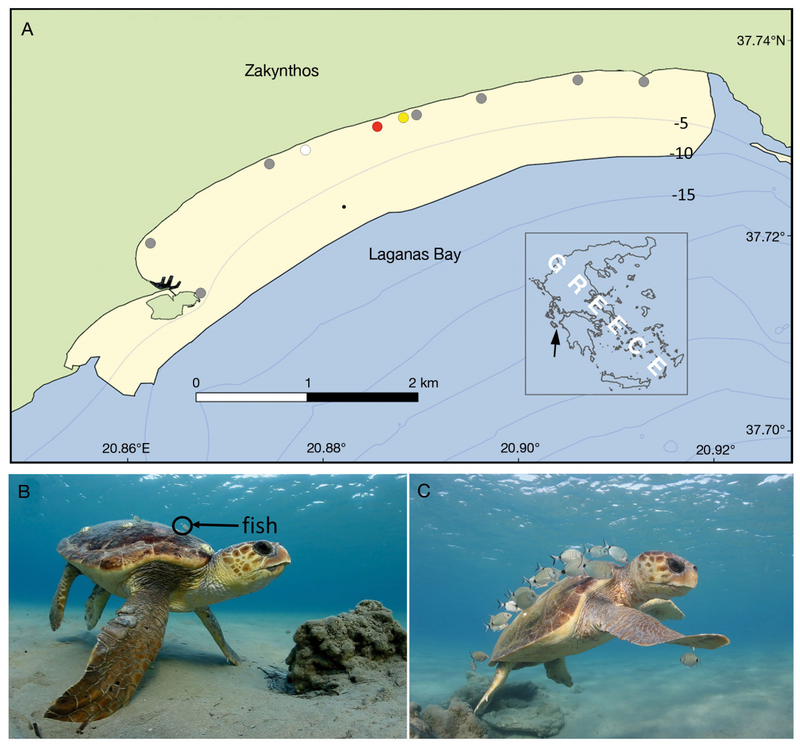 We used aerial (unmanned aerial vehicles, UAVs) and underwater surveys to investigate whether loggerhead sea turtles Caretta caretta actively or incidentally invested in using fish-cleaning stations at a temperate breeding area (Zakynthos, Greece), although they are expected to minimize movement to divert energy to egg development. If the former, we hypothesized that turtles would swim into the station (UAV surveys), visit multiple times and compete for access (underwater surveys). Underwater surveys showed that station location changed annually, ruling out usage of a long-term cognitive memory. UAV surveys showed that turtles began using the station immediately after mating activity decreased (mid-May), with use remaining high until females departed (July). Wind direction (primarily southerly) was correlated with the frequency of use (UAV and underwater surveys) and direction of movement through the station (from upwind to downwind); however, turtles swam actively (i.e. did not simply drift). Of the unique turtles photo-identified during underwater surveys, 25 and 18% of individuals were detected multiple times within and across surveys, respectively, with at least 2 turtles competing for access to cleaner fish in most surveys. UAV surveys showed that more turtles were present within 100 m of the station compared to the turtles detected by underwater surveys at the station, suggesting individuals may visit the station repeatedly through the day. We conclude that turtles might initially find a station incidentally; however, repeated visits and competition for access suggest that turtles receive direct (stress relief, epibiont removal) and/or indirect (health, fitness, migratory) benefits.